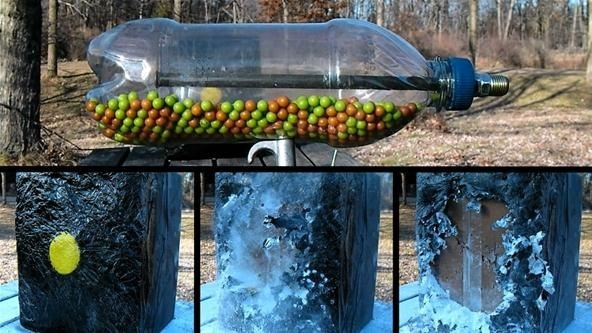 A soda bottle is the perfect inexpensive and commonly available pressure vessel for this particular type of BB gun. Believe it or not, soda bottles are rated to a pressure of well over 100 pounds per square inch in order to withstand the gas pressure built up by carbonation. Both the pressure resistance as well as the easily removable cap (which is convenient for reloading) makes for an ideal design. The following video will detail the construction process and demonstrate the extremely high rate of fire of this simple and very effective design. Please remember as always to share this article with others on Facebook and Twitter, and if you really want to support my projects, submit this article to other sharing sites sites such as Reddit and Digg. this is so awesome! great tutorial. I tried to make something like this, but using a pulsejet engine concept and a potato gun. needless to say...it blew up. but i shall try this air compressor method! Why thank you. Be sure when you try it to use a pressure rated bottle from a carbonated beverage or you might have the same issue you did with your pulse jet. Not that a water bottle bursting would be any real danger, but you would end up with a whole mountain of pellets being dispersed everywhere. lol! well it wouldnt be the first time that's happened to me. Could a pvc container in the place of the pop-bottle work just as well? Cant the stuff be easierthan a blowgun and other stuff? But i was wondering, if it's possible to make one for bigger ball. My target is throwing a cricket ball which weigh between 5 1/2 and 5 3/4 ounces (155.9 and 163.0 g) and measure between 8 13/16 and 9 in (224 and 229 mm) in circumference & require speed is avg 90 mile per hour. I was wondering if you can help with that. hello. this is really awesome video. also, i just wondering that i tried to get the 7mm automotive brake line however, they don't have it. where can i get it? thanks!